If you have a light load you will do fine with a light backpack. This really contributes to a low base weight as the pack very often is the heaviest piece of gear you carry. The development of light packs means that you do not need a pack heavier than 1,800 grams (4 lbs) to carry 25 kilos (55 lbs). In my experience you also do not need packs with more capacity than 60 litres (3,600 cu inches) for hikes of 7-14 days if you choose your gear according to my advice. Gossamer Gear Mariposa Plus with packraft and 6 days of food in Padjelanta, Swedish Lapland. Note "barefoot" shoes. The pack belongs to the three big items and is for many hikers the heaviest piece of gear we lug around. Here you can shave off pounds without losing either comfort or safety. Today, many packs on the market are exceedingly heavy and over-engineered with features that very few hikers need, but still are forced to carry every step of the way. This, however, is changing, although not as rapidly as one would think. Luckily, today lots of light and yet sturdy packs can be found in many stores. If you do not regularly go tenting in winter conditions, when the gear tends to get bulkier, you do not need to choose an extra roomy pack. The pack I used for Coast2Coast Sweden 2013 was back again in 2015, but not on my back. I lent it to Lars-Birger, our oldest thru-hiker so far, 78 years old. Instead I used an 'over-kill' pack, an HMG Porter Pack 4400. It is way too big, but still fairly light at 1060 grams. 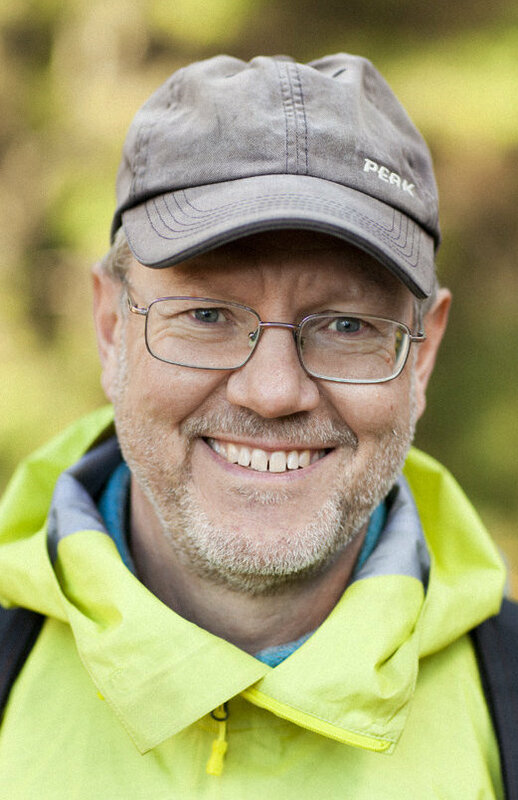 What Lars-Birger used is an old edition of Golite Jam, holds around 50 litres (3,000 cu inches) which is enough for a one week hike, sleeping out and carrying all the food. The pack is also large enough for 3-4 days of winter camping and more than enough for any hike where you spend the nights in cabins. You may think I offer this advice because I am an extreme ultra-lighter, but that is not the case. If you follow the moderate advice I give you will end up with a pack base weight of around 6 kilos (13 lbs) excluding food and fuel. This is sneered at by true ultra-lighters. Anyway, my advice is that you do not buy a pack bigger than 60 litres (3,600 cu inches), unless you have considerable amounts of extra gear such as cameras, fishing equipment or climbing gear. If you carry a light load and do your packing with a bit of care you can do without a frame, internal or external, on your pack. Golite Jam 2/50 with 8 days of food on 500 km walk through Swedish mountains. A frameless pack of 50-60 litres (3,000-3,500 cu inches) does not need to weigh more than 400-900 grams (1-2 lbs). Frameless packs in this league are usually intended to handle loads up to around 13-15 kilos (30-34 lbs) and these recommendations often have good margins. I have had no problems carrying heavier loads than recommended in several frameless packs. Usually, the extra pounds are food and fuel at the beginning of a hike and therefore up to a kilo (2 lbs) will disappear into your “front pack” (tummy) every day. However, today there are so many lightweight packs that have some sort of frame that I hesitate to recommend frameless ones. They also seem to be leaving the market. If you choose a pack with some kind of frame or support, there is a considerable number of products that weigh between 0.5-1.8 kilos (1-4 lbs). 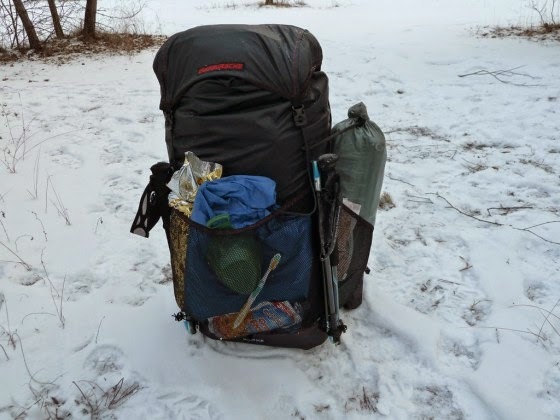 In my opinion, you do not need to choose a heavier pack at all, unless you regularly plan to carry heavier burdens than 25 kilos (55 lbs) for many days. A bonus, if you choose a light pack like the ones described, is that they usually are much less expensive than the flag ship packs of the large manufacturers. Mostly you will save about 1 Euro/1USD for every 10 grams (1/3 oz) of pack. That is, a pack that weighs 1,000 grams (35 oz) usually costs around 200 Euros/USD less than a pack that weighs 3,000 grams (100 oz). This rule of thumb actually works for most gear, except high-quality down sleeping bags. The article in Swedish where Martin Nordesjö made the calculations can be found here. If you hike from cabin to cabin and if you can buy some of your food in these cabins, you will virtually never have to carry more than 5,000-6,000 grams (11-13 lbs). Then you can use extremely light packs. Some have a capacity of 30 liters (1,800 cu inches) and only weigh 100-150 grams (3-5 oz). However, the weight penalty is small if you want to choose a slightly sturdier pack. But, for cabin hikes I would not buy a pack that weighs more than 500 grams (1 lb 2oz). 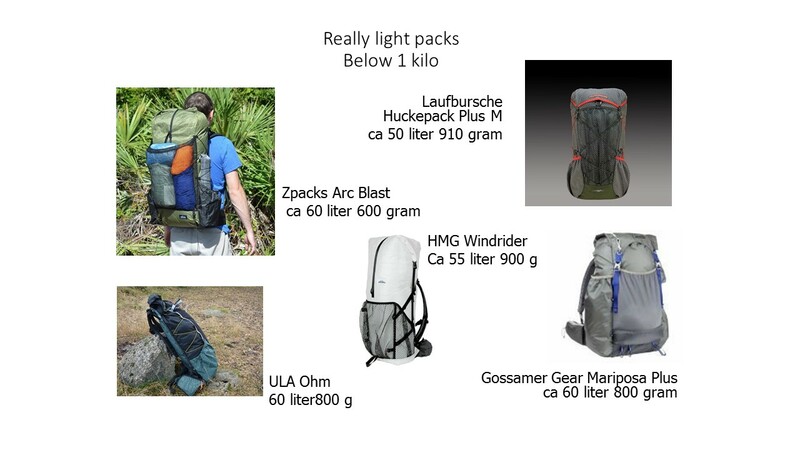 Among the lightest packs used on C2C during the years, and the overall most common pack in 2013, was the Laufbursche Huckepack. It is probably a more or less ideal minimal pack for the circumstances, where you will not need to carry much food and can keep your total packweight below 10 kilos all the time. The Laufbursche packs of today have gained a bit in weight, though. Packing a frameless pack well means that you should try to create a frame with the gear you put in the pack. And the same approach does not hurt if you have a light pack with a minimal frame. Things that are long and stiff go closer to your back, in order to keep the pack from collapsing like an accordion. Tent poles are good if you have them. I use my light camera tripod as a sort of frame, if the pack is heavy. Often, it is sufficient to “think elongated” and pack elongated items vertically inside, instead of horizontally. When everything has been packed, it is important to compress the back area well. This gives you a reasonably stiff contraption that makes weight transfer to the waist belt possible. This weight transfer to your hips is essential. Do not mistake the packs I am describing here for ordinary day packs of the same size. These are usually not constructed for weight transfer, but are made to be carried with your shoulders only. The belt is there to keep it from flopping, not to transfer weight to your hips. 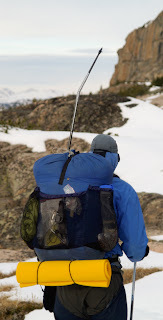 Weight transfer to your hips is important for packs made for longer hikes. You can easily find packs that weigh three, four or five kilos (7-11 lbs) on the market. The heaviest seem to be 130 litre (8,000 cu inches) packs with military connotations, in which Special-Forces soldiers can carry their personal gear as well as ammunition, explosives and other equipment that brings the weight up to 40-50 kilos (90-110 lbs) or more. 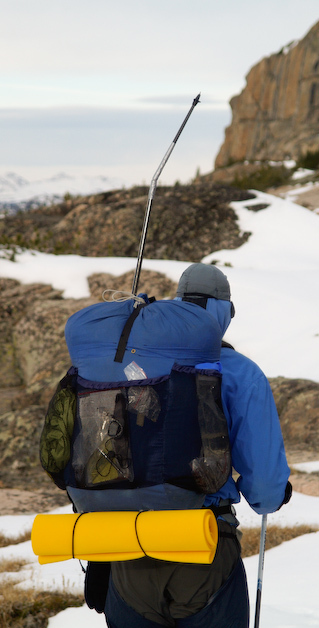 Me with homemade, frameless pack and broken hiking pole in Beartooth Wilderness, Montana. Photo: Ryan Jordan. But for hiking you can buy a pack that is considerably cheaper and use the money you save for tickets and food for another week or two of hiking. I can repeat forever that you can save a lot of weight by choosing a light pack. The backpack belongs to the three big ones and merits a lot of attention. Certainly, you also have to have light gear to put in it. If you are an experienced backpacker you will have no problems with a frameless pack weighing less than 1 kilo (2 lbs 2 oz). 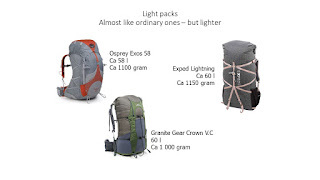 The same goes for the less experienced hiker, but if you feel a bit uncertain about what to choose, I recommend a pack with some kind of simple frame, weighing maybe 1,2-1,8 kilos (3-4 lbs). You need nothing sturdier if you are going to carry less than 25 kilos (55 pounds) of gear in it. Here is an article by expert backpacker Chris Townsend on how 1,8 kilo packs handle 25 kilos of load without. problems. I certainly hope no one plans to carry this for C2C. Below you will find some examples of packs that I suggest you take a good look at. In fact, most of them are overkill for a hike like C2C or any lowland hiking where you carry little food and sleep inside. But they will serve for this as well and expand to take the load for more ambitious hikes. Also note that in many cases they come in different sizes depending on your own lenght. Some also have special designs for women. The above packs have frames and are good choices for someone being hesitant about choosing a pack that seems to flimsy compared to the usual behemoths. Usually this is where many start going light and, realising that it works, move on to packs like the ones below. Jonas used a Huckepack on both Coast2Coast 2013-2014 and was very satisfied, but says that if you pack 11-12 kilos into it the load transfer system breaks down, particularly the shoulder straps digging into your shoulders. For 2015 he used a Zpacks Blast which worked fine. For 2014 (and also 2015) I used an HMG Porter pack 4400, which was a complete overkill since it is a 70 liter pack weighing slightly over 1000 grams. That was simply because it is a new pack that I wanted to break in before took it to Brooks Range about a month after C2C. More of that story here. But for 2016 I am either back to my old Golite Jam2 or something else. Since I am writing and testing gear for Backpackinglight.com this year something new might pop up.